One of the joys of gardening alongside and amongst, forested areas is that we can make time, despite the call of Spring's agricultural demands, to honor Nature by foraging for wild foods. Last week: douglas fir tips. 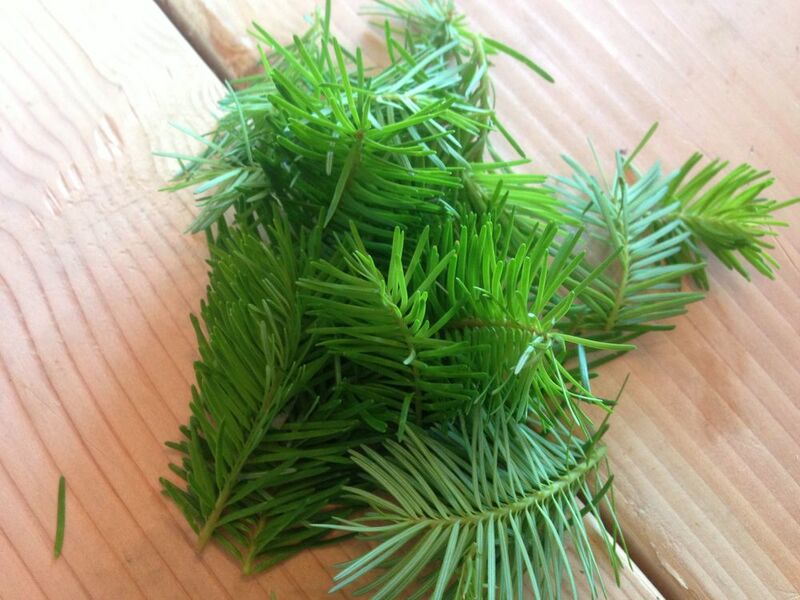 Once you learn how to properly identify a douglas fir tree, the bright green, soft, succulent fir tips that emerge in early Spring through the buds that give way from the tips of the older needles, they are always recognizable and, suddenly, everywhere. The color of the fir tips contrasts with the dark needles that they lie against -- which are also suitable for food and tea, just tougher, less lively, less light. The ancient, Native rule of harvesting only what one needs, and always leaving plenty for the tree or plant from which you are harvesting, as well as for the birds and animals that rely on your harvest for a food source, is a rule we follow strictly. There are many, many douglas fir trees at Delphi, some as tall as 100 feet, so we would have a difficult time over-harvesting fir tips, for sure! With some sugar, hot water, an ice cream maker, and a touch of gin, we made a lovely Douglas Fir Tip Sorbet with our green beauties. It was a touch too sweet, in my opinion, but delicious none-the-less. The recipe came from one of my favorite books: Living Wild: Gardening, Cooking and Healing with Native Plants of the Sierra Nevada, by Alicia Funk and Karin Kaufman. I look forward to trying additional recipes from this book as there are so many wild foods, plants, and gifts to explore in the woods here at Delphi. In addition to the sorbet, we made a simple fir-tip sun tea that has become my new Springtime beverage of choice. To replicate, simply stuff a ball jar about half full of fir tips, then pour clean water over, to the top. Seal and let it sit in the sun for 1-2 days. 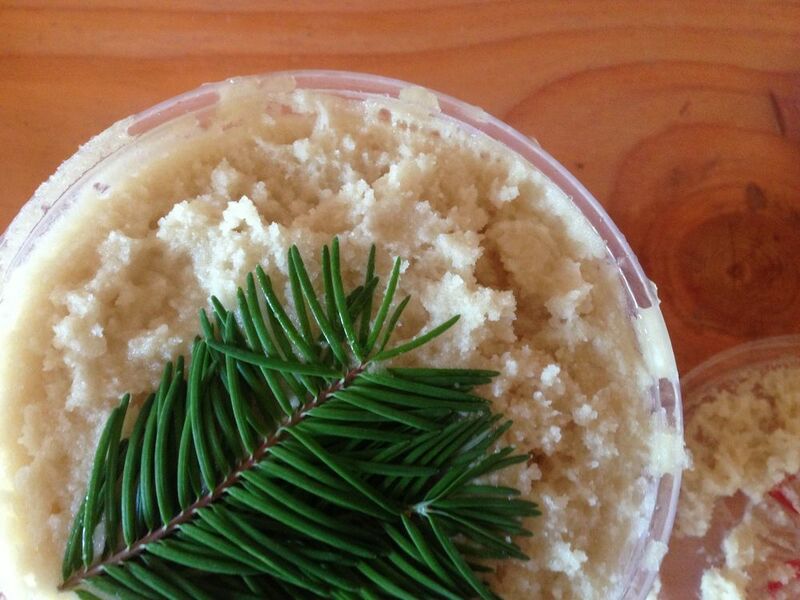 Chill in the refrigerator until and you're ready to drink it, then remove the fir tips if you'd like, and enjoy! I haven't left the fir tips in for longer than 5 days, but after 5 days time there is still absolutely no decomposition of the needles - just a stronger tasting tea. Douglas fir tips are full of Vitamin C, making this the perfect drink for gardening work on warm days...which is exactly what we've been having lots of. Enjoy!